Trane® Sintesis™ air-cooled chillers offer excellent solutions to meet customer requirements for efficiency, quiet operation and sustainability -- all with lower first costs and legendary Trane reliability. Trane® Sintesis™ air-cooled chillers offer excellent solutions to meet customer requirements for efficiency, quiet operation and sustainability — all with lower first costs and legendary Trane reliability. Energy efficiency, with over 25 percent higher part-load efficiency than required by ASHRAE 90.1–2013. Multiple sound-reduction options are engineered into every Sintesis chiller, so customers can choose a factory-installed acoustic treatment that best meets their exact needs. Environmental sustainability. Sintesis chillers are part of the Ingersoll Rand EcoWise™ portfolio of products that can use next-generation, low global warming potential (GWP) refrigerants and are energy efficient. An ideal choice for ice-enhanced chiller plants, which shift energy consumption to off-peak hours — when electricity often is cheaper and generated from a greater mix of renewable and cleaner sources, including wind and natural gas. 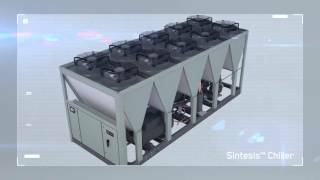 Sintesis™ air-cooled chillers with the integrated free cooling option can help building owners to even further reduce their energy use, environmental impact and operating expenses. To learn more about the features and performance of Trane Sintesis chillers, contact your local Trane account manager.